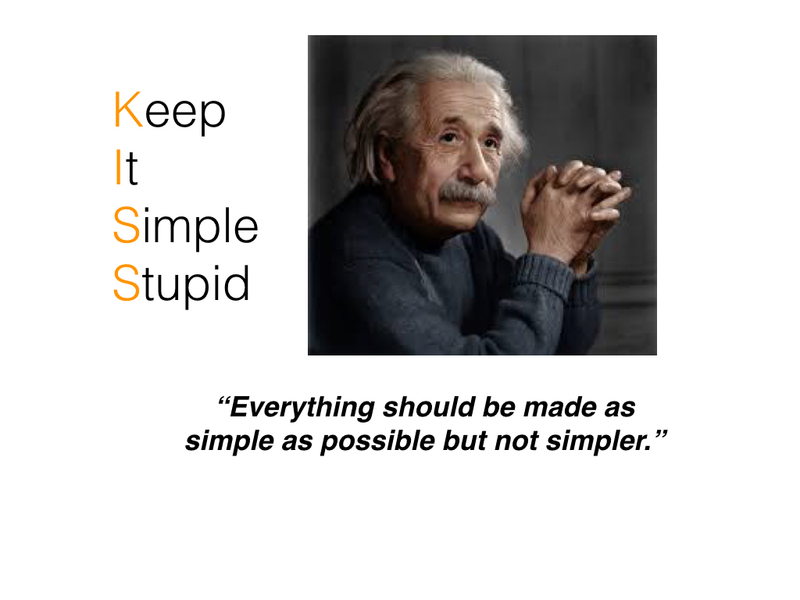 Is education reform simple or complex? The reason those concerns are more challenging in Ferguson’s mind is that they represent complex systems or problems that do not lend themselves to simple solutions. Her argument seems logical. However, it is entirely possible that our attempts to answer challenging questions in each of these systems fail because the process we use is faulty, and not that the system can’t accommodate a simple answer. In education, the process we use to solve challenges is hierarchical. Politicians, educational policy makers, and administrators dictate to schools what challenges have to be solved and the process that must be used to address the concern. For example, the data, high-stakes test scores and graduation data, suggest that all students are not mastering the standards and performing well or enjoying school. So what do educational bureaucrats do? In 2001, they design No Child Left Behind and mandate what schools must do to meet the needs of all students. Few classroom teachers or principals were involved in designing the model or marketing the legislation. The solution was designed locally, it was designed nationally and mandated. Fast forward eight years and we get Race-to-the-Top, an Obama Administration program designed to fund American Recovery and Reinvestment Act of 2009. As part of R2T, states who received funds had to redesign their teacher evaluation systems using student achievement data as part of the equation to account for “good teaching.” Again, few educators or principals were involved in creating this program. While progress was made in some states or districts, there were huge missteps in designing teacher evaluation systems that empowered teachers to improve without disenfranchising them. For example, in Georgia the Teachers Keys (TKES) process is outlined in a 200+ page manual. There have been ongoing state and national conversations about the efficacy and efficiency of these laborious models, especially when they link teacher quality to student achievement scores on one imperfect test. Implementation of these models requires enormous amounts of time from principals. Would TKES have been designed as a 200+ page process had teachers and principals been the designers? Fast forward another five years to a federal program that allows states to apply for waivers to NCLB because they are unable to meet the expectations defined by the 2001 law. As students and educators go back to school across the country, and as Congress continues to debate how to fix the law commonly known as No Child Left Behind, the U.S. Department of Education announced today that states whose waivers from certain provisions of federal education law will expire at the end of the 2013-2014 school year will soon be able to request renewals of their reform plans, for up to two more years. I would propose that these top-down federal or state programs, with very complex implementation plans, are ineffective at meeting the outcome we all desire, that all students receive a top-notch education, because they remove the important players, teachers and principals, from the design process. In fact, these solutions are too complex for a problem that could be handled with a simpler or straight-forward process, a process that puts teachers and principals in the design and decision-making role. 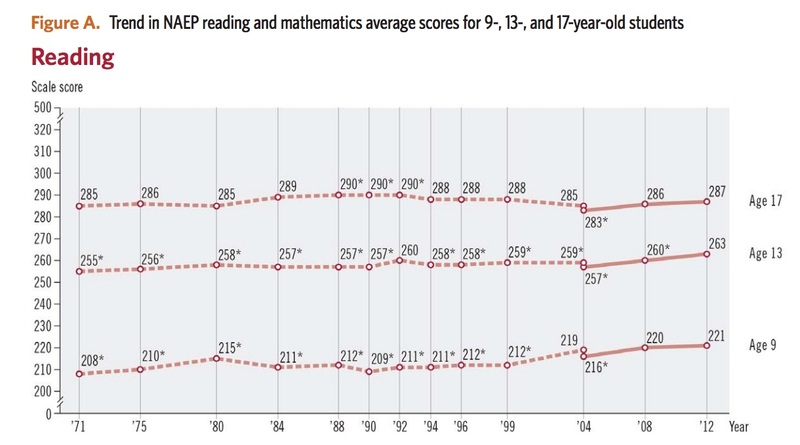 Below is a graph NAEP (National Association of Educational Progress) reading scores for 9, 13, and 17 year old students over a twenty year timeframe. This period of time encompasses all of the program’s referenced above. So our nation’s report card (NAEP) illustrates that the investment of hundreds of billions of dollars into complex solutions to educational problems does little to advance student learning as measured by improvement in reading scores. I realize this might be an imperfect test; however, you might think that after investing billions we would have more to show for our effort than ‘flat test scores’ over time and graduation rates that still hover around 80% (click here). Teachers and principals need resources, free from the enormous constraints of federal and state governments, to design and implement programs that are aligned to local problems. They should be challenged to design programs that meet the needs of their students and take into account the unique challenges they face. We can’t assume that all students across the US come to school with exactly the same problems that impede their learning. Granted there are some universal issues like poverty, homelessness, or broken families that impact whether a student comes to school ready to learn. But I contend that if you support creative teachers and resourceful principals with resources and the authority to implement their ideas, they will design for their user, the student. Their designs will most likely be simple because their user is their student body not the student body of the entire United States. They are in the best position of understanding local conditions and their students learning needs. To make this work, we would have to invest in developing strong school-based leadership. Evidence that investing in “middle-level” leaders results in local solutions that can change the face of school, can be found in another article in Phi Delta Kappan, School Leadership Lessons from England, written by Jonathan Supovitz. In England, the education system was redefined and roles and responsibilities of leaders were designed with a new approach. Middle level leaders, teachers, were accountable for teaching, learning, and student behavior. It was their job to design and implement programs that fell under their jurisdiction. The government did assume responsibility for providing more comprehensive and effective leadership training programs for middle-level leaders and principals that was based on a redefinition of the knowledge and skills leaders would need. In the United States, what if the federal government collaborated with states, colleges and universities, and educators to identify the knowledge and skills required to lead change in schools. A great deal of research has been done on this very topic, some of which comes from the corporate and non-profit sectors. The federal and state governments would provide the funding to support high-quality leadership training programs for middle-level, senior-level, and principal leaders in schools. These programs could be administered through selected colleges and universities, but they would have to disrupt the traditional programs typically provided by colleges and universities. With leadership prepared and in place, funnel resources to local communities to address the challenges and opportunities they see for improving learning environments for all students. Yes, hold them accountable for determining the indicators of success and providing results, but give them space to be creative and design for their user, their students. I think we would be surprised that many local initiatives would be less complicated and more successful than the laboriously complex programs that have not worked. So I don’t agree with Maria Ferguson’s premise that education is a complex system requiring complex solutions. Granted, our education system serving 50+ million students is complex, but I believe solutions to the challenges we face can be made simpler if they engage the minds and hearts of teachers and principals designing for their user, the students they serve.